At United Financial–we put you first. When you work with us, you invest into us and allow us to invest right back into our local economy. We couldn’t do what we do without our members’ support, and we believe in paying back your efforts by serving our community in bold new ways. 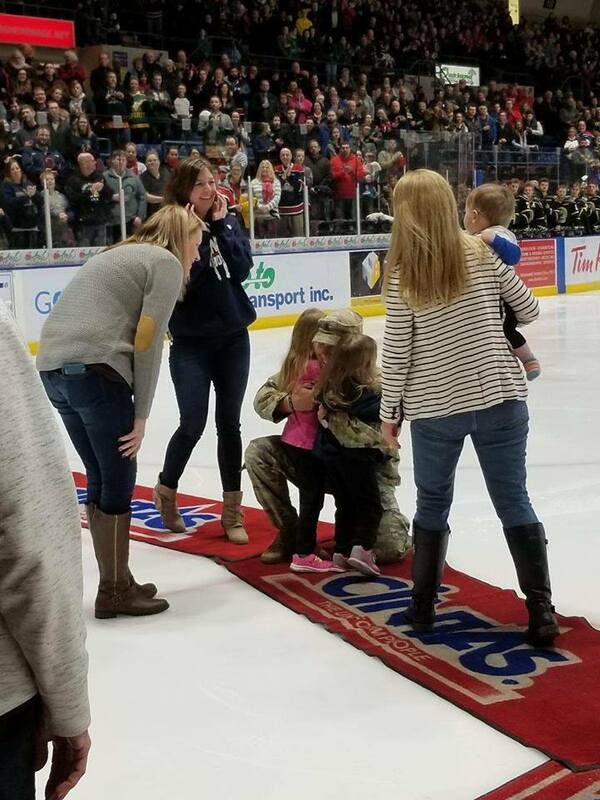 That’s why this past February, United Financial Credit Union teamed up with Yellow Ribbon Guard, Stretch Limo and Saginaw Spirit to pull off the surprise of a lifetime for a local military family. Laura Rumble and her three small children have been waiting for the return of their husband and father, Chris Rumble, since he left for National Guard duty back in 2018. “It’s hard because during the day I don’t know what he’s doing and it’s kind of frustrating because I just want him home, but I know he’s helping our family. So I just got to be supportive, but he’ll be gone for almost an entire year,” said Laura. Laura is the primary caretaker of their three children all under age 4 and has been juggling the kids, home, finances, all while trying to obtain a college degree. “I’m proud of myself because I just keep pushing through and I knew I had to get it done and to say, ‘yeah I have a degree and I also have three kids and my husband is gone.’ Everybody calls me super-mom and I’m trying, I really am,” said Laura. That’s why we thought it important to lift Laura’s spirits and bring her husband Chris home from Cuba, even if his leave wasn’t very long. 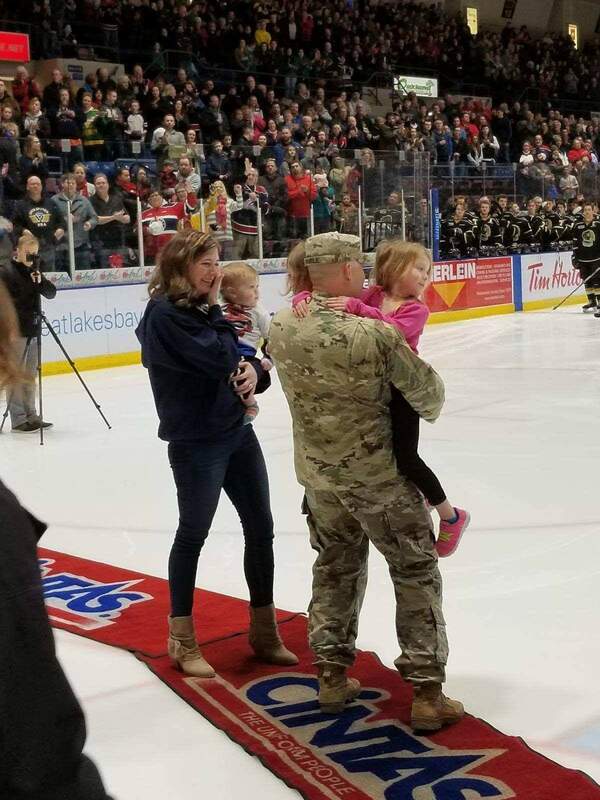 At the February 9 Saginaw Spirit game, Laura and her three children were in attendance when a message on the scoreboard showed an apology from Sgt. Rumble apologizing to his family for not being able to make the game. The announcer then asked the fans to join him in welcoming a special guest who turned out to be Chris Rumble. The family took to the ice to reunite after months apart. “We started planning this back in September and then there she was and then came the kids and it was just perfect,” Chris said. Although Chris had to return to duty, he’s already thinking about the next time they’ll be together as a family. “I’m looking forward to the late nights and early mornings with them because I’m sure I’ll be the one that’s getting up,” Chris laughed. 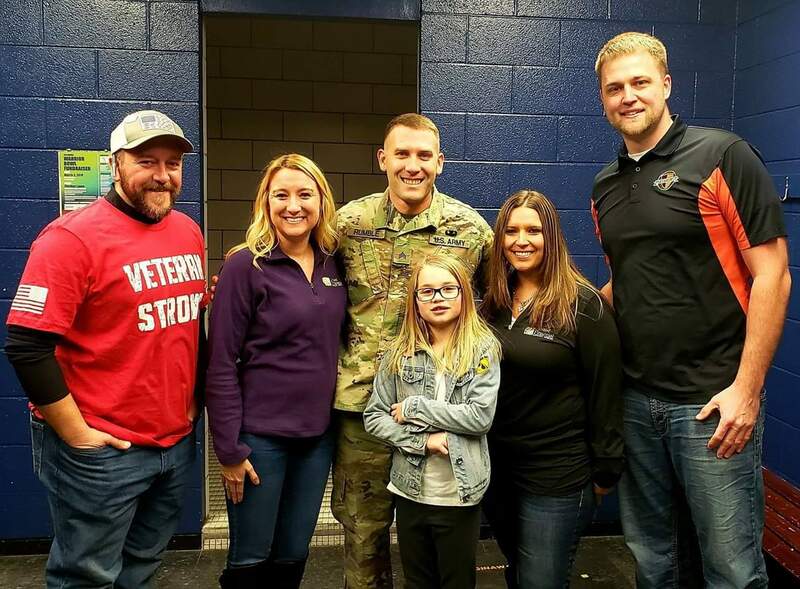 We’d like to thank Yellow Ribbon Guard, Saginaw Spirit, Stretch Limo, and Bavarian Motor Lodge for helping us to reunite this family for a once in a lifetime experience. We’re proud to give back to our local community. Have a cause in mind that you’d like us to support? Check out our page How United Financial Supports Local Communities to learn more about our charitable work.